Phillies manager Gabe Kapler should have a more consistent lineup this season. Today is the first day of spring, which means that just six of the Phillies’ spring-training games will actually be in the spring. I’m guessing “winter training” doesn’t sound as catchy. Bryce Harper will play today in right field after spending the last two days working out at the complex while the team was on the opposite coast of Florida. We’re one day closer to opening day. What does Kapler’s lineup look like? A week from tomorrow, the first Phillies lineup of 2019 will be posted on the clubhouse wall. The Phillies used 138 batting orders last season, with their most common lineup being repeated five times. But the order that is posted next Thursday could become a familiar one. “Last year, we had a lineup where we had to optimize for every last advantage,” manager Gabe Kapler said. “So lineup optimization was critical to us. We also know that the right guy in the right spot does give you an edge over the course of a long season, but it’s barely a marginal edge. So Kapler, a year after mixing and matching every night, seems comfortable with having a set lineup. That will be easier to do when there’s an everyday player at nearly every position. We know Bryce Harper will bat third and Rhys Hoskins will bat fourth. J.T. Realmuto is a safe bet to bat fifth. And Jean Segura can be expected to bat second. So Kapler, after a season of being mocked for his use of analytics, is going to go with his gut. It’s safe to believe that his gut will lead him to the player the team signed this winter to a $75 million contract. We’ll place McCutchen at the top and Hernandez at nine, after the pitcher, to give the Phillies an ideal extra leadoff hitter at the bottom of the order. That leaves your six and seven hitters as Odubel Herrera and Maikel Franco. How deep is the new lineup? Herrera spent most of last season batting third but could start the season batting sixth. Over his career, Franco has hit more from the three-spot than anywhere else. He’ll start the season batting seventh. With the depth the Phillies added this winter, it’s easy to see how Kapler can field a regular lineup. Forget about Mike Trout playing for the Phillies, because he agreed to a 13-year extension Tuesday to stay with the Angels. Dreaming of him in center field at Citizens Bank Park was just wishful thinking, as Scott Lauber writes how few around baseball ever expected Trout to reach free agency. The Phillies will begin the season without two players who entered camp with roster spots secured. Roman Quinn and Tommy Hunter, Bob Brookover writes, are expected to begin the season on the injured list. It was different last year when Gabe Kapler declined to give his relievers defined roles out of the bullpen. But now what was different should feel a little like the norm. Brookie writes how the team’s relief corps, which the Phillies think is one of the best in baseball, should be accustomed now to the way they bullpen is used. If you haven’t subscribed to our podcast, Extra Innings, be sure to do so in iTunes or wherever you find your podcasts. 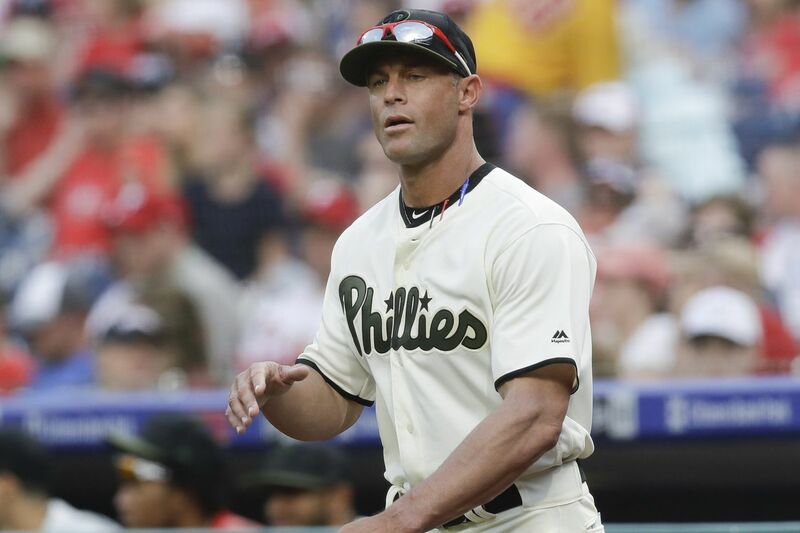 Gabe Kapler was our guest this week and he talked about how to manage Bryce Harper, how his job changes with expectations, and the feedback he’s heard from fans. We’ll have a new episode every week during the season. Today: Bryce Harper plays right field against the Tigers, 1:05 p.m. Tomorrow: Phillies host the Blue Jays, 1:05 p.m.
Friday: Final spring-training night game at Yankees, 6:35 p.m.
Monday: Phillies break camp vs. Rays, 1:05 p.m.
March 28: Opening day vs. Braves, 3:05 p.m.
Bryce Harper smiling after teammate Rhys Hoskins hit a two-run homer against the Blue Jays on March 9. Unless the two are injured, it’s safe to assume that Harper will be playing nearly every day this season in right field and McCutchen will be playing every day in left field. Filling the corner outfield positions will be one of the easier parts of Kapler’s lineup construction because the Phillies will finally have continuity in right and left. Since 2015, the Phillies have used 30 players in left field. Remember Jordan Danks? How about Hyun Soo Kim? The Phillies played 26 players since 2015 in right field. Did you forget Daniel Nava? Or Jimmy Paredes? How about Brian Bogusevic? It was four seasons of a revolving door in the outfield.